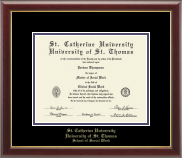 Dimensions Diploma Frame in Westwood with Textured Ivory/Purple mats. 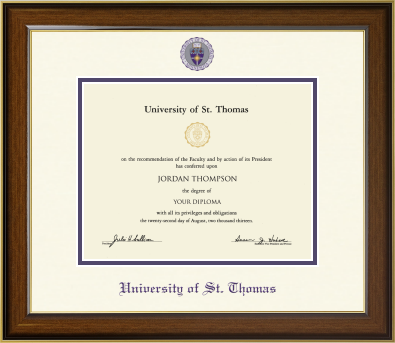 41BA The University of St. Thomas seal and name are featured with vibrant color and added depth on textured ivory and purple museum-quality matting. It is framed in Westwood, our contemporary moulding featuring a walnut brown finish with gray undertones and warm, gold accents. 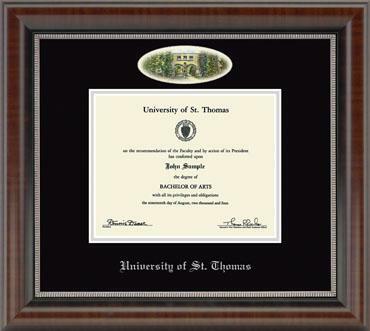 19BA - Silver Embossed Achievement Edition Diploma Frame in Academy with Black Mat •Features the school name and official seal silver embossed on black matting. •It is framed in our Academy Edition moulding with a rich mahogany furniture finish and an inner black lip. •This frame fits a Bachelor's degree. Silver Engraved Medallion Diploma Frame in Eclipse with Black Suede/Purple mats. 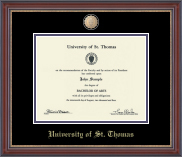 40 BA Features a silver engraved medallion of the University of St. Thomas seal set into a silver bezel within black suede and purple museum-quality matting and the school name silver embossed below. It is framed in Eclipse moulding crafted of solid hardwood with a black satin finish and high-gloss inner lip.